Let’s get real here. I have a lot of issues. I have issues with people who walk around barefooted, I have issues with lipstick, and I have serious issues with quick breads. Quick breads are breads which use baking soda and/or baking powder as a rising agent rather than yeast. They are kind of like a muffin in loaf form. My “issue”comes down to this; I LOVE quick breads (heck, I love any bread), but when I’m baking these wonderful lovelies I feel some kind of overwhelming sense of power. My thought process is this; quick breads are a blank canvas, a canvas I can cover in any thing and everything I find in my pantry. Dried cherries! Pistachios! Oh my word, flaky sea salt! It’s a real deal problem as I don’t know when to stop adding. Alas, it happened to me again and I ended up eating way more of this bread than my skinny jeans wanted me to. 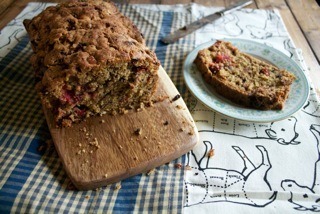 This particular bread was one of the happy results of a quick bread power frenzy. It’s sweet, tart, full of dark chocolate, walnuts, and everything wonderful. It’s also one of those breads that I don’t know when to stop eating. Turns out my issue makes for some seriously major afternoon gorging. I’m embracing my issue, let’s make some bread. 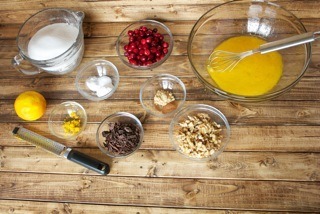 And our team includes; cranberries, walnuts, dark chocolate, ground cinnamon, ground ginger, orange zest, all-purpose flour, sugar, kosher salt, baking powder, baking soda, eggs, and vegetable oil. Whisk to combine cinnamon, ginger, orange zest, flour, sugar, salt, baking powder and baking soda, set aside. In a separate bowl beat together eggs and vegetable oil. 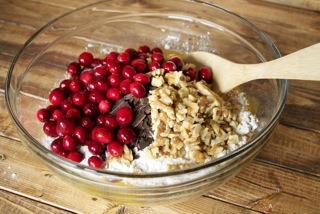 Fold in dry ingredients along with chocolate, walnuts and cranberries. Do not over mix, the batter with be very thick and lumpy, leave it alone. Pour batter into a loaf pan lined with parchment paper. Bake at 350 degrees for about 1 hour and 15 minutes or until a skewer poked in the middle comes out clean. Embrace your issues and eat bread! Whisk to combine cinnamon, ginger, flour, sugar, salt, baking powder and baking soda, set aside. In a large bowl beat eggs and add oil. 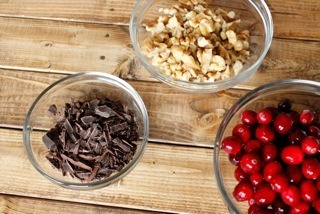 Fold in dry ingredients along with chocolate, walnuts and cranberries. Do not over mix, the batter will be thick and lumpy. 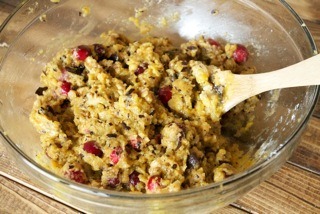 Pour into a loaf pan lined with parchment paper. Bake at 350 degrees for about 1 hour and 15 minutes. Enjoy!